Easy Baked Chicken is a time tested, foolproof, and delicious recipe! This method will give ya flavorful and tender-as-can-be chicken breasts, every single time. Hi there friends! I know it’s been a hot minute and I know it’s like after such a break y’all are like… chicken breasts? really? But, this is an important recipe. Trust me. I’ve been honing in on perfect and easy baked chicken breast for about a year now. And, I’ve finally perfected it. It’s the perfect chicken to have prepped n’ ready to go at all times in the fridge and freezer. It’s great for quick and easy dinner when you’re feeling something extra simple. I love piling this chicken on salads and in wraps and sandwiches. It’s ready to share and it’s more than ready to eat! I’m going to keep it short and simple up here because I’ve got lots to talk about while I’m showing y’all what to do. Alright? Alright! This is an important question, and there’s a very easy answer: Maybe. When you purchase Chicken Breasts at the grocery store, they’re not all the same. It really depends on what type you buy. Some will say “contains sodium solution.” This means they’re pre-brined. If I know I’m running short on time, I will buy Tyson All Natural “Trimmed and Ready” Chicken Breasts. These are pre-brined, trimmed up, and can go straight into a skillet and be juicy and flavorful without brining. If the packaging doesn’t say along these lines, it’s more than likely not pre-brined. If you buy pre-brined chicken and then brine it again. It will be too salty, I promise. So be sure to check the label on the package. Brining chicken breast makes a huge difference! I didn’t learn this until I was bout 20 years old. I loved chicken breast, but I truly hated making it for myself.. It seemed like no matter what I did, it ended up dry and tasteless. I often ordered chicken breast dishes at restaurants, and it would be juicy and flavorful. Seriously, why couldn’t I recreate a delicious piece of chicken? How hard could it be! I didn’t cook like I do now, but I knew my way around a kitchen or two. I can’t remember just how or when I learned of it exactly, but there’s a good chance it was Food Network. Food Network was basically my very prestigious culinary school, and ya know what? I’m totally proud of that. If your chicken breasts have not been pre-brined, brine those babies! It’s totally easy, one of the easiest thing you’ll ever do in the kitchen. If you’re not completely new to these parts, you might’ve made my “Almost Famous” Skillet Pickle Chicken. Remember how you let it sit in pickle juice for a while? That’s a brine, but it’s pickle juice-flavored. And if you’ve tried that recipe, you know it’s worth the extra step! 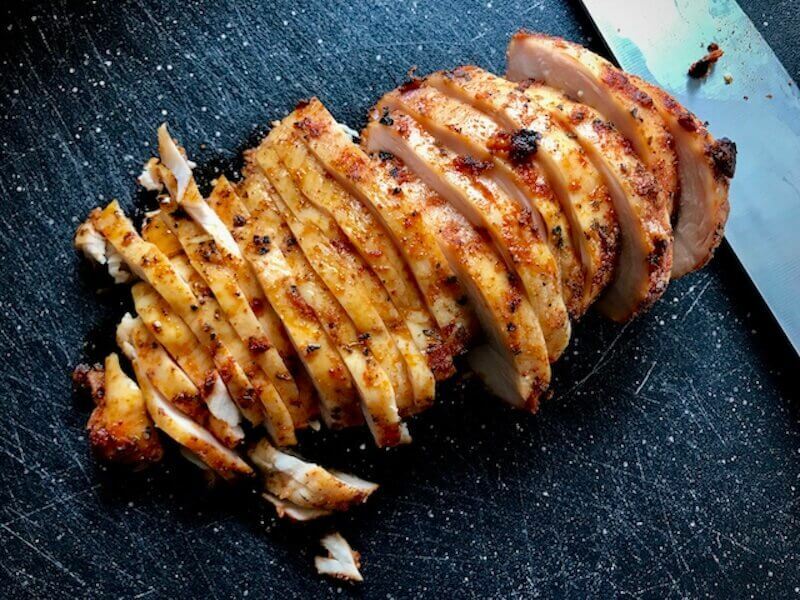 Put your chicken breast in a large bowl or tupperware with a lid. Slowly add enough lukewarm water to cover them. Then lightly stir in 1/4 cup Kosher salt. The amount of salt does increase or decrease depending on how much chicken breast you use. For two pounds I’ve always used 1/4 cup, so just adjust that up or down a bit as needed. If you don’t have kosher salt on hand. That’s okay, but if using regular table salt/sea salt be sure to reduce the amount of salt by half or your chicken will be too salty! Cover tightly and place in the refrigerator. I do this for up to 6-7 hours, but even 20-30 minutes makes a pretty big difference. If you go much longer than 8 hours it will be on the salty side. I read somewhere (or maybe I heard it on the good ol’ Food Network University!) 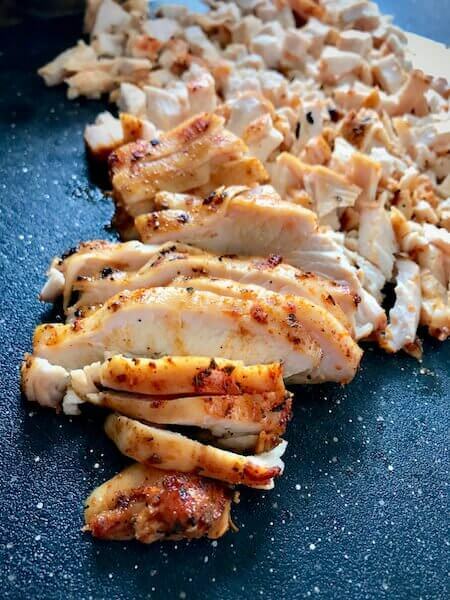 that the salt works to break down the toughness of the meat, making the chicken flavorful and tender as all get out… and that the extra tenderness even makes it harder to overcook! Now I’m no food scientist. But I can tell you that when I’ve brined chicken, I have never overcooked it! Anyway, that was my spiel about brining, and how I really believe it’ll make any piece of meat insanely delish. Is it a deal breaker if you don’t? No. But trust me- you want to. Have I steered y’all wrong before? My favorite thing about Skinny-ish eating is that there’s so many ways to make it more delicious! And something as simple as a salt water brine makes plain ol’ chicken breast so much better. Please remember there are two major rules when it comes to brining. Don’t double brine… meaning don’t brine chicken that’s come pre-brined again and if you are not using the kosher salt decrease the amount of salt! These two rules are pretty important because your chicken will be too salty if not followed. Option two- just really mix’m up good with a spoon. This time around I did the spoon method, because I didn’t feel like getting those chicken goobers all over my hands. You know, I can’t explain it- there’s days I don’t mind it at all, and days that I’d rather never ever touch it again in my life! Now we just throw those babies on a baking sheet. Just to make clean up easier, I put aluminum foil over it. Any lil bit helps in my kitchen! Again, it’s up to you if you want to do this. Before throwing’m on there, go ahead and lightly spray the pan or tin foil with cooking spray. Like we said earlier, not all chicken breasts are created equal. Some are quite a bit smaller than others, and it makes a real difference in cooking time. A small chicken breast is going to be fully cooked 5-8 minutes sooner than a larger, thicker one will. These days, just about every store-bought chicken breast seems to be on the larger side. But there are instances when they might only be about 5-6 ounces. To find that balance between over- and under-cooking, use your own judgment- If you have a smaller breast, bake at 450 for about 15 minutes. And of course, Always check the temperature with a meat thermometer. Insert it into the thickest part of the breast, and before continuing from this step, it should read 165 degrees. If it’s almost there, put it back in for a few minutes. A larger chicken breast (the ones that I have pictured are large) will take somewhere in the range of 22-25 minutes at 450 degrees. 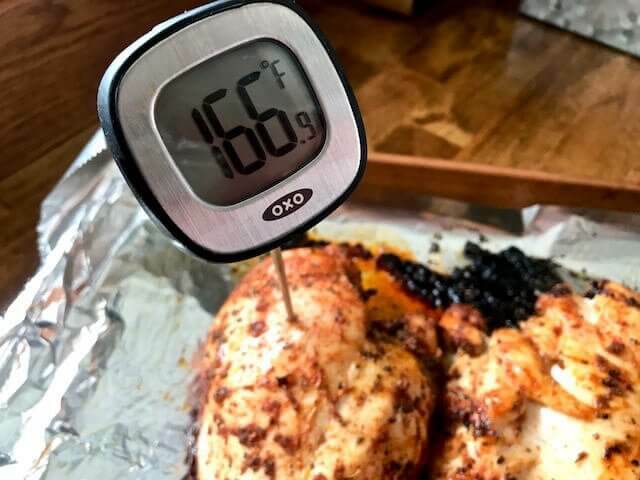 Whichever size you have, temperature is the key to serving up the best chicken. Nobody wants undercooked or overcooked chicken, ever. Pro tip: If you want chicken breasts that are a little more brown and crispy, broil your chicken for the last few minutes of cooking. I personally do this every time, and the chicken in these recipe pictures has been broiled for a few minutes. Ta-daa! And here’s another important part… let those babies rest, okay? Just literally leave them alone on a cutting board or serving plate for about 8-10 minutes before slicing into it. Resting your freshly-cooked chicken is the best thing you could do for it, trust me! 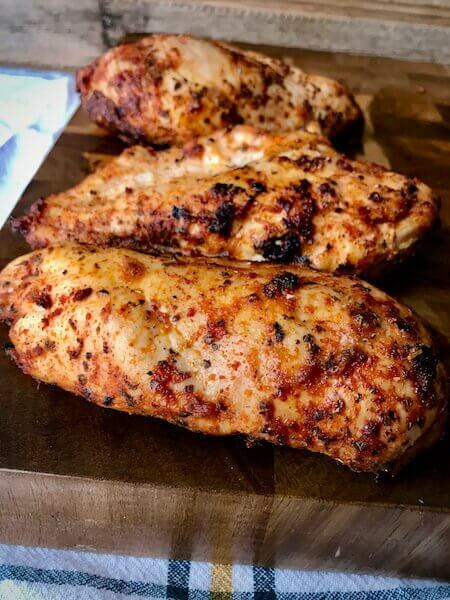 When you pull a chicken breast or any other piece of meat out of the hot oven and just slice into it immediately, the juice and flavor just run right out! Sooo sad. Or go ahead and dice it up if you wanna. Because tomorrow, I’m going to feature this chicken in a crazy-healthy-delicious Southwest Chicken Salad recipe.I just know you’re all going to LOVE IT as much as we do! So keep this easy and wonderful recipe in your back pocket. I hope it’s becomes something you make all of the time to have on hand! Or just enjoy a serving next to some Roasted Garlic Cauliflower Mash, or maybe Roasted Sweet Potatoes with Bacon and Parmesan, or just some yummy vegetables. Over the years, I’ve tried all sorts of stuff to figure out a perfect chicken breast recipe. One that’s delicious, easy to make, and can be used to add a protein to all kinds of meals/dishes. And this is the one, it’s taken the place of all the others I’ve used before. If you make this recipe, please comment below and share your thoughts! 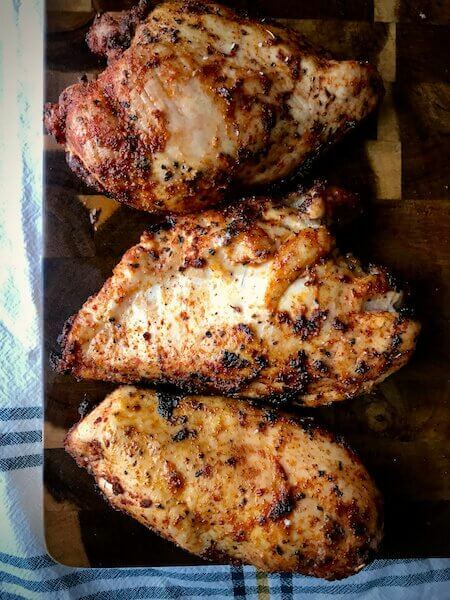 Let me know what you think, or if you have any awesome tips for cooking chicken breasts. After all, we should never stop learning. I’m always trying new things in our kitchen! If your chicken has not come pre-brined (see the post above for more details about this) and you’d like to brine your chicken which is the preferred method. 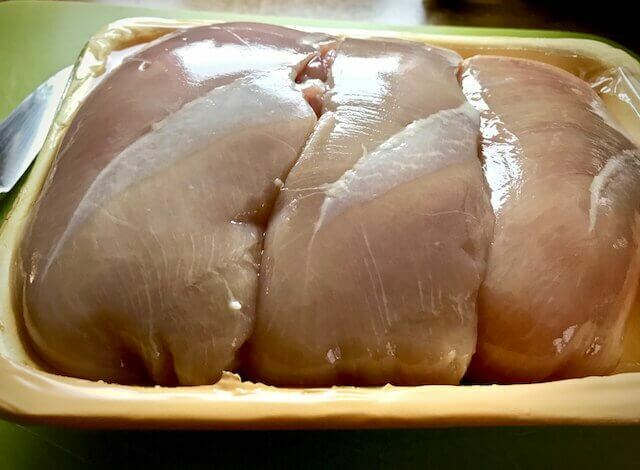 In a large bowl or tupperware place raw chicken breasts and cover chicken breasts with lukewarm water. Slowly stir in 1/4 cup of Kosher Salt and then cover. You can do this early in the day and let it sit in fridge for up to 6-7 hours or you can do it as quickly as in just 20-30 minutes before baking. If chicken comes pre-brined skip this step because the chicken will be too salty. Remove chicken breasts from package or brine and pat dry with a paper towel. Place in a large bowl, add olive oil and spices. Rub spices and olive oil into meat very well with hands. If using a spoon instead of hands, make sure it is distributed very well. Transfer to the oven and cook for 22 to 25 minutes, or until internal temperature reaches 165 degrees. Thinner breasts will need less time, thicker breasts might need a little more time in the oven. For crispier and browned chicken breast turn your oven to broil for the last 3-4 minutes of the cooking time. Remove chicken from oven and set aside. Let the chicken rest for 8-10 minutes before slicing into it. Makes 27 ounces or 5-1/2 cups. Serving size: About 3/4 cup or 4.5 ounces. Chicken will store in fridge for up to 5 days and in the freezer for up to 2 months. *If you are using fresh chicken breast that has be pre-brined, do not brine again! Check the label on the package of chicken. If it says anything about a sodium solution. It has been brined already. If you double brine. It’ll be too salty. *If you are not using Kosher Salt, Reduce the amount of salt by half! « 2018 Top Ten Skinnyish Dish Recipes! Made this tonight for dinner. Delicious! What if my chicken bag says, “Contains up to 15% chicken broth, salt, and natural flavor?” Should I brine?? Hey Tessa! I’m 95% sure that means they were pre-brined. I would skip the brine! I am so sad that I’m just making this! I will never make chicken breast any other way. Thank you! I made this recipe for the first time the other day. It smelled DEVINE while baking. I only had about 45 minutes to brine this and I did find it a little dry, so next time, I will make it on a weekend when I have more time to let it sit in the salt water for longer. I am using the left overs tonight with pasta but the first night, it made a perfect topping for my big, busy salad. I will make this a weekly thing. So easy and absolutely delicious. I have tried a few of your recipes now and they have all been great. I can’t wait for our next office pot luck so I can make a big ol’ batch of your corn pasta salad! Thanks for all of the wonderful recipes. Is the recipe you mentioned for Chicken n’ Cheese Quesadilla available? I’m excited to try this and hoping to use the other recipe as well. I did a search and it didn’t come up. Made this for the first time tonight and it was a hit! I used a premade seasoning from Weber because it was just quicker on a weeknight after work. That’s the good thing about this recipe…it’s so versatile!! And I did brine the breasts beforehand so I’d like to think that attributed to the yumminess!! Thank you for all of your recipes! Tried this recipe for the first time today and it really is a game changer!!! I struggle so hard with making chicken breast and this was amazing! I can’t wait to make it again! I’m so happy you enjoyed, Kristin! Sooo good!! My hubby loved it too! Said more than once how good it was. Thank you!! Yes! That’s always such a good feeling! This one is a keeper! So easy and delicious! Restaurant quality. I sliced it up for sandwiches and kept looking at it like “did I really make this?” Lol. Can’t wait to eat it for lunch tomorrow! Is there another way to know if chicken was pre-brined? I didn’t see anything about the soldium solution on the package and followed the directions but i think it must’ve been pre-brined. Where would I look for the sodium solution info on the packaging? Can’t wait to try this recipe, nice and simple. I love your blog, learned a few things, thank you. I meal prepped this on Sunday and ohmygod, this is amazing! Thank you so much for this wonderful recipe! I think I am going to make this every weekend for my meal prep it’s that good!!!! Ps. I love alllll the writing at the beginning and everything that goes into your posts! I’m so happy you loved it, Lauren and enjoy the blog too! Thanks for letting me know. Hey star!! Just want you to know you’re awesome! That’s all. Have a good day!! Hahaha, awe thanks Abbie! Always nice to open up my computer to a sweet lil comment like that. You have a great week! Oh my heck! This is absolutely delicious! My husband really likes it too. This is a great method and delicious recipe! My chicken came out moist and tasty. Brining really made all the difference! I’m so happy you loved it, Mary Jane! Thanks for letting me know! So I saw both your recipes, this one and the Skillet Pickle. Today was the first time I tried it. I used the pickle brine method from your other recipe and the methods you say in this recipe to cook , and OMG, you’re amazing!! The chicken is awesome!! I’ve never been able to bake chicken and not have it dry and chewy-ish. Thank you so much!!! love love love this recipe. 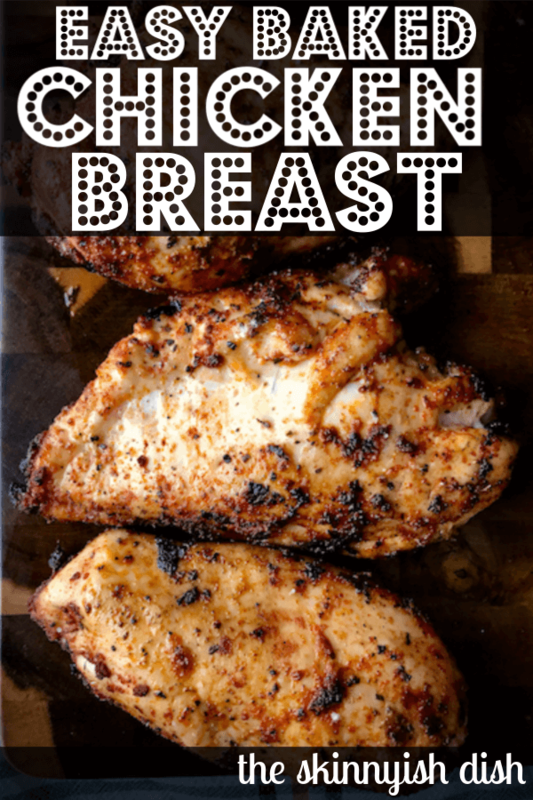 like you, i had almost given up on trying to make chicken breasts on my own – this is DEFINITELY going to become a staple chicken recipe for me! i already made it twice this week and it was a hit all around! how would you suggest reheating the chicken so that it doesn’t lose flavor/become dry? I made this recipe for dinner tonight. I did brine my chicken for about 7 hours. Using two of my four chicken breasts, I cooked them on my Foreman Grill (I took the other two breasts out of the brine) and packaged them for tomorrow. They turned out juicy and nicely browned and delicious ~ very nice flavor. I thought this was a quick method to cook them rather than the oven. I’m not a fan of warmed up chicken so tomorrow I will make the other two breasts for lunch, again on the Foreman Grill. I think this time I will not add salt to the spice mix and see how that goes. It wasn’t extremely salty and my husband agreed but I thought I would give it a try and see the difference. Thank you for this wonderful recipe. PS I would give this 5 stars. I couldn’t get the stars to highlight for me. Thanks Kathleen! I’m so happy you and your husband approve! I’m sorry the rating part didn’t work for ya either. I probably need to update something on my end. haha! Hi Star! I can’t wait to try this recipe. I’m looking for chicken I can make for lunches throughout the week. My issue is that when I re-heat the chicken for lunch it always turns out tough and dry. I’m wondering if anyone has tried this recipe and reheated it? Tips? Suggestions? Thoughts? Hi Jenn! I haven’t had that issue with this chicken. I reheat it and put it into a bunch of different recipes. I think it must have to do with the brine and how juicy and tender it makes the whole thing. I’ve also sliced it up, reheated it in a frying pan and threw it on a plate with some rice and it was perfect! Jenn here – Just wanted to provide an update; I can report that it is still just as tender and juicy throughout the week! I’ve made it for the last two weeks straight for lunches. This recipe is a definite keeper! Thanks Star!!! 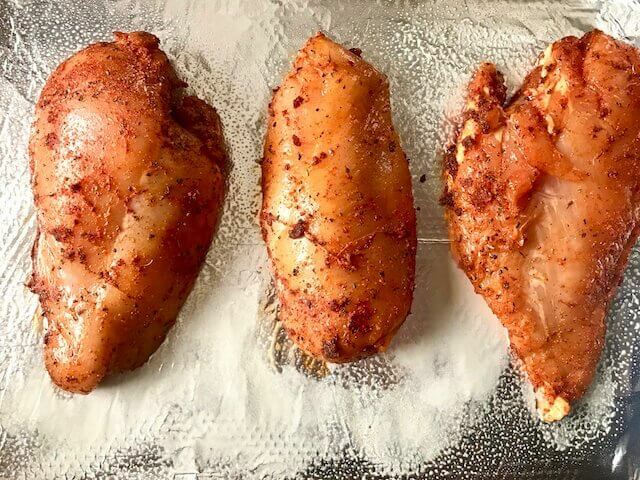 Can I do this with bone in chicken breast? Do I have to adjust cook time or brine time? Thanks and I love your recipes! It should totally work! I’ve seen a few people do that now with this recipe. I’m not sure on the time adjustment, but I would just check your it with a meat thermometer at about 20 minutes and see where it’s at. This chicken is amazing!! So flavorful and jucy! I don’t think I’ll make chicken any other way now . Thank you for this recipe! I just finished this recipe, and I’ll probably never bake chicken different ever again. Thank you for sharing! I’m excited to throw it on your Southwest Chicken Salad this week for lunches. Question about brining and kosher chicken..kosher chicken is already saltier but it isn’t more moist. Ideas? Thanks!!! I have honestly never seen or tasted Kosher chicken so I’m not really sure how to answer this. I would just try using regular fresh chicken breasts and then brine them yourself. If you brine that other type of chicken and it’s already salty it will for sure become too salty for taste. Made tonight! Super yummy! Shared Your recipe with my parents and grandparents! Can’t wait to make it again! … wow this post has a lot of !! !, it was that good!!!!! Thanks Star!!! Is the kosher salt the key to the brining or can regular salt be used? Thanks! Excited to try this! I have to say…I usually can’t stand all the extra story telling on most recipe blogs (certainly not enough to rudely post about it), but yours are different! I really enjoy your photos, anecdotes and ability to have an accent/twang via text! Your recipes are awesome! Keep on doing what you’re doing! This is legitimately the best chicken I have EVER made! The brining! It makes all the difference. 30 years on this planet and I never knew! My chicken will never be dull and bleh again! Thank you for bringing me into the light! I’m so happy you enjoyed it, Sarah!! Thanks so much for stopping back by to leave me a comment! Hey, Star! Thank you so much for sharing your recipes. I work in a group home and someone else makes up a menu and buys the groceries. When I get to work the menu says “Chicken breast” nothing else. I was like, SAY WHAT???? At the time, I didn’t know to brine, and I didn’t have your recipe but I just pulled any spice out of the cupboard that looked good (it’s harder when I’m not in my own kitchen). Anyway, the spices ended up being the same ones in your recipe! I just sprinkled them all over, then put in a 350 oven for awhile. The guys thought it was awesome! Also, on another note, I’m trying to figure out where in southern Iowa you live. Up here by Des Moines today, the wind chill is 40 below and I’m snowed in. 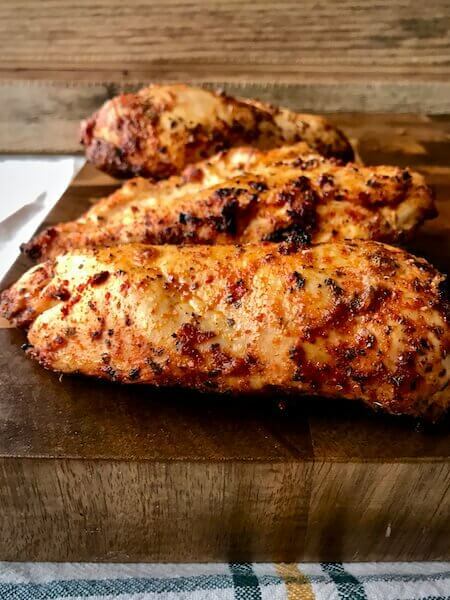 I’m thinking I should pull some chicken breasts outta the freezer…..
I’m new to your site….and so far, loving it, and your commentary!!! Can’t believe some people can be so darned rude. Ignore that and focus on the rest of the world who seems to love you!!! Me included. Chicken tomorrow night… it’s frozen right now. Looking forward to trying your methods! Thank you!!! I was so excited to try brining for the first time. Flavor was good but WAY too salty for my taste 🙁 I’ll try again without the salt in the seasoning rub. Is there a time limit to brining? Such thing as too long? Hi Stacy! I’m so sorry to hear it was too salty. You can brine for too long. I’d say max 8 hours, but it’s safer to go 6-7 hours. Also, Did you use Kosher Salt? If not and you used table salt/sea salt you will need to reduce the amount of salt by half. Thank you for sharing this method. The chicken came out with a great. Do you ever rinse the chicken after you brine it? Mine was really salty. I used 1/4 cup of table salt instead of kosher salt, is that why? I was wondering if this has happened to anyone. Hi Aesha! Yes the 1/4 cup of table salt is exactly why it was too salty. If using table salt/sea salt you’ll need to reduce the amount that’s used by half in the salt water brine and in the spice rub. Hi! Cant wait to try this recipe, just wondering if the chicken breasts need to be flipped halfway through or just leave them the entire time? Thanks! I leave’m as is the whole time! I hope you love it! Love the comments and cooking tips! Don’t stop! You’re my favorite food blogger and I’m never disappointed with your recipes…Ever! Thank you for making weight control easier and much more delicious! I’m hoping to make this tomorrow and wanted to brine the chicken in the morning… Unfortunately I do not have kosher salt. Can I substitute regular salt or sea salt? I apologize if you already answered this but I cannot find the answer if you did LOL… So excited to finally try one of your recipes! Hi there! You can use table salt/sea salt, but reduce it by half in the salt water solution and the spice rub. I hope you enjoy! Oh my gosh!! I made this last night and the chicken came out so delicious and the seasoning is fabulous!! This is a FOOD BLOG Deb…and a freaking fantastic one! The world doesn’t need so much snark, can’t you just say THANK YOU for someone taking the time to GIVE us such an abundance of delicious recipes??? I made this today and was skeptical of the brining. Buuuut…they were perfect and I will be having these on repeat! 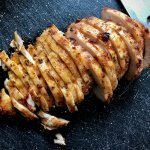 I’ve been searching (for years) for the best way to prepare chicken breast in the oven that eliminated them being too dry and/or rubbery. This is it! I’m so happy you loved this method and enjoyed’m, Kristen! Thanks for stopping by to rate the recipe. I appreciate it! They finally sat long enough for me to take a taste!! 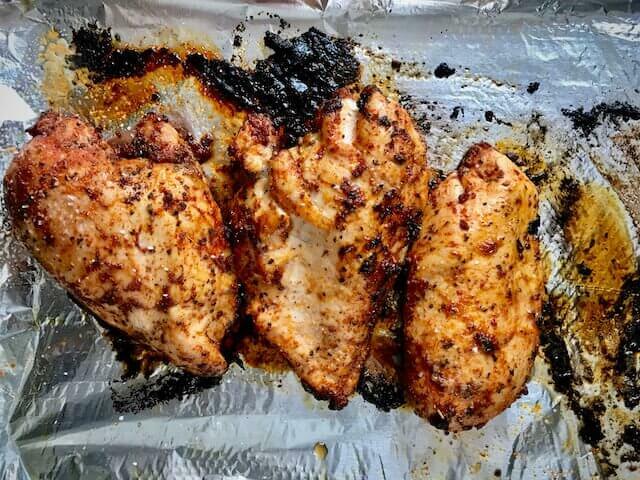 Delicious, great method to cook chicken quickly with a ton of flavor. Thanks for another winner!! You’re welcome! So happy you enjoyed them, Michele! I love you Lady lol. This chicken changed my life!! Yasss! I’m so happy to hear this! Thank you for posting this. I always struggle with knowing how to bake a chicken the “regular” way. I have a question, do you rinse the chicken off after brining or just pat dry straight out of the brine? I just pat it dry personally because raw chicken being rinsed in my sink makes me feel like it could get anywhere haha, but I think it’s normal to rinse it! Some people always rinse their chicken before using it. If you want to rinse it, just pat it afterwards! Thank you so much!! Yes I rinse when I first take the chicken out of the packaging bc the slime about does me in. Trying this today. And also I like reading the stuff before the recipe! This recipe WILL change my life. THANK YOU. Oh how I struggle to make a decent and consistent chicken breast. Thanks again. I know this will be perfection. Thanks for the explanation above the recipe. VERY helpful to me every single time. I hope you love it, Martha! Chicken breasts can be a tough, but once you crack a few codes. They’re so easy and so delish! First and foremost, that Deb up there is a turd, huh??? She needs to write her own recipes and criticize herself. Her mom and dad should have taught her better. What a shame to be so nasty. Anyway, I am a brining convert, after reading/enjoying YOUR FULL POST, and following your recipe. I didn’t see your reply, so I have to confess, I did brine from frozen because I was so excited to try this recipe out. I can’t get over the chicken. It actually changed the entire consistency. It is a game changer, for sure. This recipe is so flavorful and the chicken is moist and tender. Super delicious and easy, which makes it even better. I will be brining from this point forward and this recipe will become my go-to for everyday chicken breast. Thank you for your creative and entertaining blog. Your recipes are fabulous. Your pickle chicken and street tacos on next on my list to try. Your posts just make me smile. I love the photos. Everything always looks so delicious. Thank you for sharing all these recipes with us. I have a question b/c I am making this today. I have NEVER brined chicken, and I’ve made a ton in my lifetime. I am soooooo excited to try this and am guessing I will be a briner from here on out. My question is… I took my chicken breasts out of my freezer. Can I brine them from frozen???? Hi Tracey! I would recommend that you let them thaw first. I truly have never done it from frozen, so i just don’t know, but I did just add this to my to do list to test out and see in the very near future. I hope you love it! 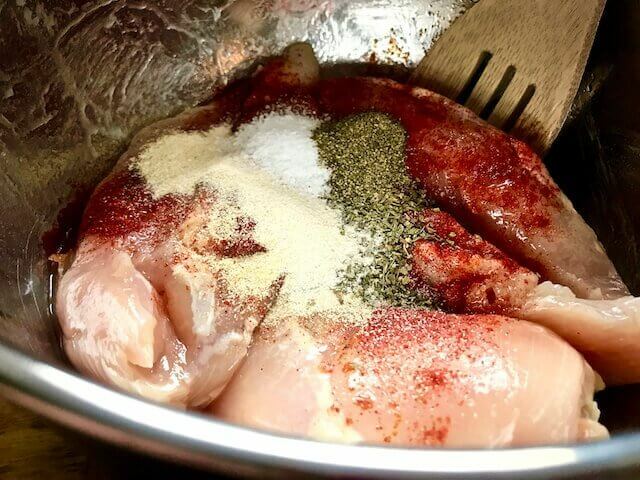 I don’t ever pound the chicken out unless I’m doing a couple different certain type of recipes. I don’t know why, but I just don’t like having to do that step. Haha! I do cut them in half for even cooking in a lot of recipes in the skillet though! And Yes, this recipe totally works in the skillet as well! Hi Deb. I’m sorry you feel that way. I didn’t realize scrolling was such a tough job. I do process photos and I like to write in my posts. Maybe someday I’ll change this, but not today. Please keep your blog just the way it is! I like the personal touches you add and if I don’t have time to read the whole thing guess what……I scroll! Either way, as a newbie to WW I GREATLY appreciate your recipes and info!!!! THANK YOU!! Thank you, Dena!! That means so much to me. Please keep it the way it is, I love it! It’s called SEO. You wouldn’t have found this particularly, awesome, bribed chicken recipe without it. Hi Wendy! I’m so glad you enjoy the site! I actually don’t write for SEO purposes too much. I probably should though. If an SEO expert saw my site they’d probably cry. Haha!! love it!! Some people are just too much! When you get to the page, do a search on “print” and it will take you to where you can see and print out the recipe. Perhaps buying recipe books instead of finding free recipes online will help. I am grateful she even posted this. Thank you for posting all these great recepies. Always gives me ideas of meals for my family. I made this chicken this week and it was delicious! I had chicken to chop for salad, chopped some more to put in the black eyed peas I made, sliced some up for my lunch wraps with salad mix, cheese and avocado and chopped some more up for chicken salad! My husband had one whole one for dinner with veggies and black eyed peas! Very yummy and easy to spice up more if we wanted. We had chicken for meals all week! You can’t imagine how much you influence people’s journey to eating healthier and losing weight (in my case). Thank you and I love your back stories with the bonus recepies of amazing food!